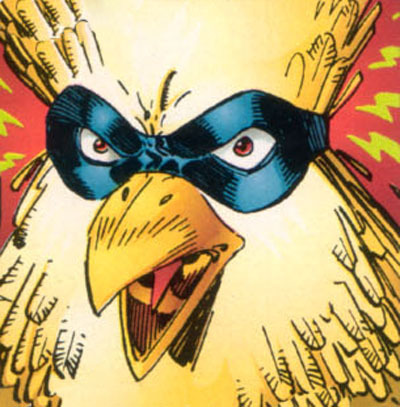 Other Distinguishing Features: PowerHouse has the facial features of a bird, complete with beak and feathers. Denny Atlas was a scrawny child that was the subject of constant bullying throughout his school life, an existence made infinitely worse by his home life. His parents had been driven insane by voices in their head which resulted in them committing suicide by shooting themselves in the head. Denny was sent to live with his grandmother, but the same madness claimed her and she was committed to a mental institution. This led to Denny being moved around different foster homes where he grew up a constant outcast, terrified of what new tragedy would impact upon his life. He took a job at a convenience store where the former classmates that bullied him became aware of him once again. They took great delight in tormenting him further. Unfortunately, the voices that had invaded his relatives’ minds had now infected Denny and he eventually decided to silence them. Rather than harming himself, Denny accepted their instructions and sought out his birthright. A tiny box was unearthed and contained a simple domino mask that attached itself to Denny’s face, transforming him into a true descendant of the Sun God known as Ra. After discovering his newfound abilities also left him with a somewhat comical facial structure, Denny started going by the name of PowerHouse. He realized that he was still an outcast but now had both the inner and outer strength to overcome this adversity. PowerHouse relocated to Chicago where he joined fellow freaks in the criminal organization, the Vicious Circle. He acted as merely one of OverLord’s army of superhumans until the armored villain was killed in battle with Dragon. Following this assassination, the opportunity for PowerHouse to assert himself came about. After a devastating gang war, CyberFace was installed as leader of the Vicious Circle and he quickly gathered a group of inner circle that he could trust. One of these lieutenants was PowerHouse and he was given responsibility over numerous assignments and he carried out each task to a satisfying conclusion. While loyally serving CyberFace, PowerHouse repeatedly found himself clashing with the arrogant and reckless BrainiApe. This thug believed that he should run the Vicious Circle and he rebelled continuously until PowerHouse apprehended him and turned him over to CyberFace’s mercies. BrainiApe resented this treatment and harbored a deep hatred for PowerHouse. CyberFace’s rule over the Vicious Circle was short-lived due to his gradual decomposition as a result of not being properly resurrected following his murder. PowerHouse watched on as Horde stepped into the role of leader and he refused to become a pawn of the villain, choosing instead to head up a rebellion. PowerHouse surrounded himself with the scientific genius’ of OpenFace and Octopus, along with the infant energy generator, Baby Boom. Together this small group was able to rebirth CyberFace. The Vicious Circle entered into a battle royale that saw both CyberFace and Horde killed for good. While BrainiApe made off with a portion of control, PowerHouse held onto the power he had desired for so long and he intended to lead the Vicious Circle to glory in the same way that CyberFace had wanted. OverLord was unwittingly recreated and a three-way battle for leadership began. PowerHouse proved himself to be the most resourceful and tipped off the Chicago branch of the SOS to the plans of BrainiApe which led to his incarceration. He then provided intelligence to Dragon so that he could eliminate the biggest threat to him, OverLord. This gave PowerHouse full control over the Vicious Circle and he dedicated himself to trying to forge them into an even better organization, aiding freaks in any way they can while keeping down street crime which was bad for business. The somewhat peaceful nature of PowerHouse enabled him to develop a strange relationship with Dragon and the pair would aid one another where they could. When Baby Boom was abducted by the Covenant of the Sword, PowerHouse handed over information that would allow Dragon to lead a rescue mission for both the missing infant as well as other missing superhumans. Unfortunately for PowerHouse, all of his hard work was destroyed when the second Nega-Bomb was detonated and utterly annihilated the Vicious Circle. He and Fever were all that remained and they agreed to help most of the world’s remaining heroes in taking the fight to the Covenant. PowerHouse later agreed to join up with the United States government’s S.O.S. team and he took Fever with him so that they could begin a new life on the other side of the law. In the other reality that Dragon found himself in after a confrontation with Damien DarkLord, PowerHouse was able to rise to prominence much earlier in this timeline due to CyberFace assuming control of the Vicious Circle quicker. He soon became a valued lieutenant to the villain as he seized command over the whole globe. Unfortunately, this position of power was not to last as the deployment of the God Squad had PowerHouse abducted to Godworld. The later destruction of Godworld left PowerHouse back on his homeworld of Earth but he was unable to escape this captivity. He remained a resident of God Town, only experiencing the outside world briefly when accompanying Herakles on his mission against the Sky-Riders and Monster Master in order to retrieve the Eternal Youths. When the floating God Town accidentally crashed into the Earth, the Forever Serpent was unleashed upon the mortal world once more. 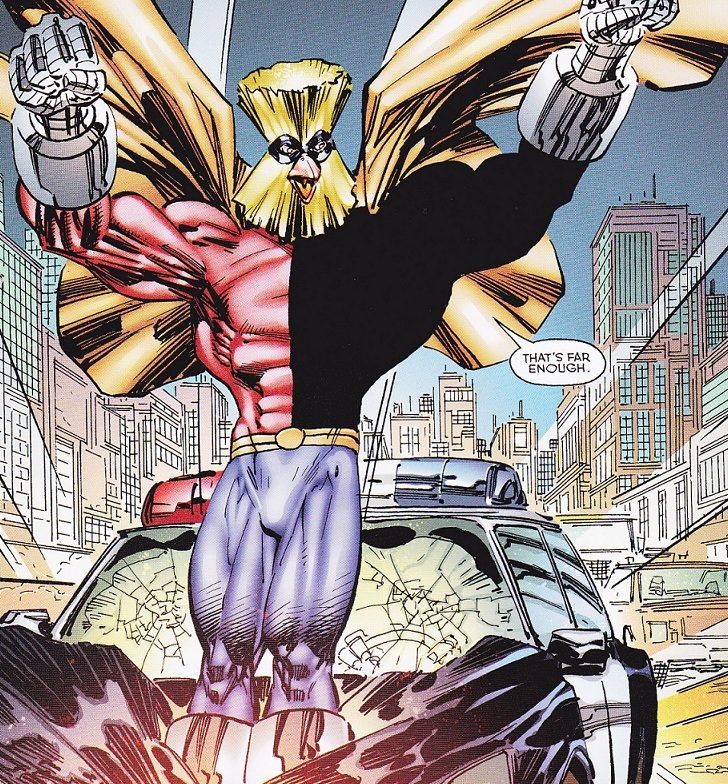 Dragon was recruited by the government in leading the Special Operations Strikeforce on a mission to investigate. The Gods and their allies eventually destroyed their foe but the resulting devastation caused AllGod to rescind the vow of non-interference with humans. Herakles then formed another incarnation of the God Squad, including PowerHouse that could perform heroic acts on behalf of humanity. Some time after this, PowerHouse decided to return to Chicago where Fever and he began a relationship. Many of the old faces in the Vicious Circle had fallen out of favor including PowerHouse and he found himself in a state of depression. The OverLord was advised by Octopus and OpenFace to seek out PowerHouse’s help in garnering loyalty from the Vicious Circle. This seemed to have occurred as PowerHouse helped Malcolm and Angel Dragon take down two of his own colleagues when they went against OverLord’s wishes and carried out criminal acts. Powerhouse is next seen at Vicous Circle meeting on what should be done about OverLord III. Powerhouse ended up being the voice in favor of OverLord III and his methods in unifying the relationships between humans and freaks. After OverLord III (Flash Mercury) is arrested and is being transported by the Police, Powerhouse intercepts them and frees Overlord III. He flys away and carries Flash Mercury in his arms. He then has a discussion with Flash to form some sort of partnership between the pair and gives him his mask back as a sign of good faith. Powerhouse later introduces Flash Mercury to a few second generation members of the Vicious Circle. However, they soon come across a brawl between the Vicious Cirlce and the Claw. Both try to stop the Claw, but are quickly beaten. Powerhouse and Flash Mercury are soon kicked out of the Vicious Circle and banished from Chicago by FirePower the new leader of the VC for not sharing the same ideals as the current VC regiment. After leaving Chicago, Powerhouse along with Fever and Flash Mercury start a business taking care of threats around the country. Their first assignment is Dr.Frankenstein and his monsters which they quickly take care of.